Home › Abundant Life › Hidden Doorways — Waiting . . . Son (in-law) Dave has driven off to a meeting in Palm Springs and so dinner was simpler — left over veggies and pre-cooked meat from Whole Foods. Such a good life! 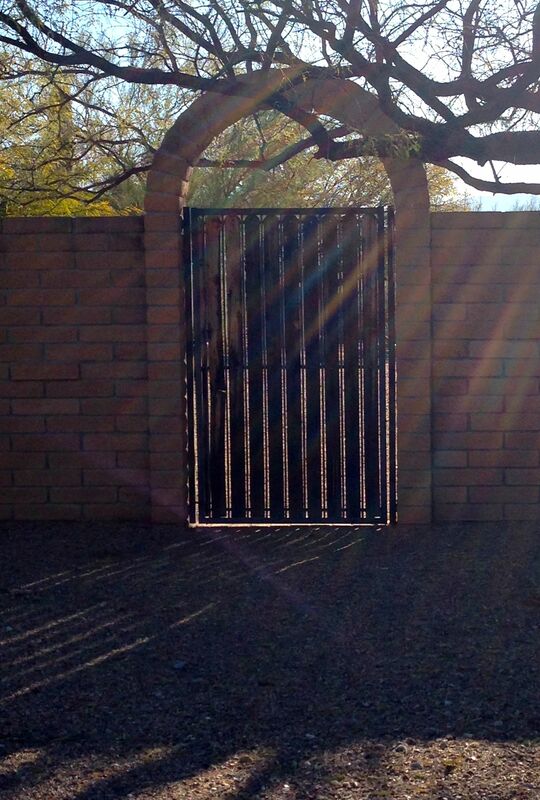 This gate caught my eye this morning on my jog. I’m sure I’ve run by it before but never noticed it. I stopped for a photo, but I didn’t go and peek inside. And, of course, didn’t even think about trying the handle. Routines do become ruts — and ruts just let us roll along with minimal effort. Ah, Effort! It does take energy and focus to SEE doors — and even more to find out what’s behind them. And as for Opening Doors? That’s even harder. Thankfully, our children and grandchildren have Higher Expectations for me. I promised daughter Suzanne I would take an Art Class and so today I signed up for Beginning Watercolors! And grandson Mark is teaching me to upload photos to Instagram. Meanwhile, daughter, Sandy, has nudged me on to the Commit App. Small doors, perhaps, but they are helping me open to a more Expanded Self. Thank You, God. And thank you, family!